There are many registers present in the 8051. We will look each of them in consequent posts. For now let us see most widely used registers of the microcontroller 8051. They are A(accumulator), B, R0, R1, R2, R3, R4, R5, R6, R7, DPTR(Data pointer) and PC(Program counter). All of them are 8 bit registers except DPTR and PC register, which are of 16bits. Each register will have corresponding address. I think you got a little idea of how we move data into the registers. We will look this topic in depth in further posts. 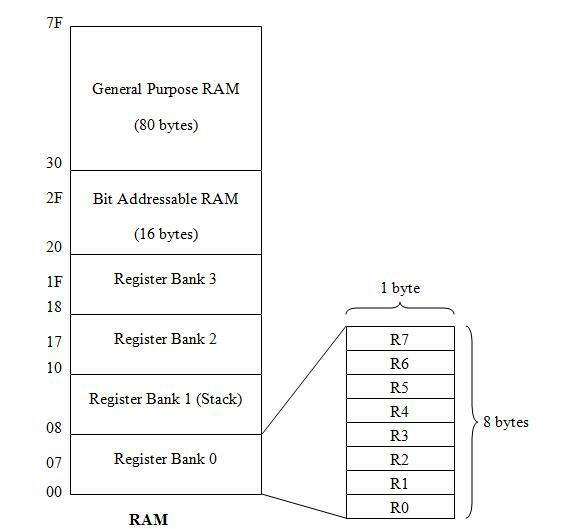 Now let us look at the Register banks in the 8051 i.e how registers are arranged in the RAM and their addresses. 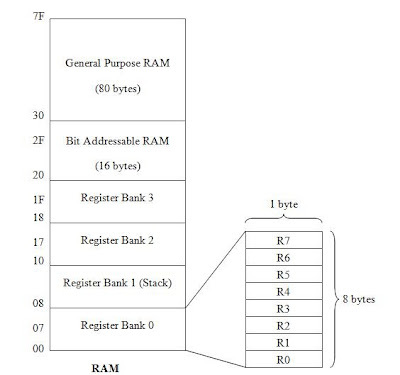 32 bytes are set aside for Register banks and stack i.e from 00 to 1F. These 32 bytes are divided into 4 banks i.e Register Bank0 , Bank1, Bank2 and Bank3. So, each bank will have 8 bytes(32 div 4). These 8 bytes are divided into registers R0, R1, R2 .... R7. Every bank will have register with the name R0 to R7. Note that all the banks have the same register names i.e R0 to R7 but their addresses are differ which are indicated in red color. Next 16bytes( from 20 to 2F) are set a side for "Bit Addressable" , we will look about them in detail in further posts. Now say me registers R3 and R0 are belongs to which bank??? When powered the microcontroller as default it is set to the Bank0. So R3 and R0 are belongs to the Bank0. Now again say me if we want to switch from bank0 to other banks then what should we need to do??? For this purpose we have a special function register called as PSW (Program Status Word) Register. If we want to switch to any bank then we need to change the RS1(or psw.4) and RS0(or psw.3) bits of PSW to the corresponding value. As default RS1 and RS0 will be 0 so Bank0 is selected. Note RS1 is nothing but psw.4 and RS0 is nothing but psw.3. Important Note: Bank1 is also used as STACK.So in general we dont use Bank1 in our program. See the simple program below to know how to switch to different banks. Example1 : Move 25H and 30H into the registers R0 and R1 of bank2. Example2 : Move 10H and 12H into the registers R3 and R4 of bank3. Example2 : Move 2H and 12H into the registers R0 of Bank0 and R4 of bank2 respectively. As default Bank0 will be selected. Now it is clear to us that how we switch from one bank to other bank. replica omega watches,replica Breitling watches UKetc.